The PCFC has been featured in the news on several occasions. The media has recognized our excellent services and has taken the time to interview and publish stories about our practice. A beloved family member’s brush with death serves as a grim reminder of the short and fragile nature of life. It became a turning point for 26-year-old Newton native Sanjay Singh. It spurred him to participate in sponsored marathons and eventually become involved in raising money and doing charity work for the American Liver Foundation. Singh is currently an office manager at the Primary Care Family Center (PCFC) on Salem St. in Malden, where he has worked for the past three years. He was a senior at Tufts University, studying for his bachelor’s degree in economics, when his aunt developed life-threatening, diabetes-related liver complications back in 2009. Singh decided to participate in Newton’s 2011 Chilly Half Marathon, which takes place every November. The race enables runners to give back by raising money for research and aiding patients combating liver diseases. The American Liver Foundation has an official team that participates in this marathon. “I asked people to donate money to the American Liver Foundation to support my long distance running initiative,” Singh said. “I was able to raise and donate $500 to the American Liver Foundation.” Flushed with this success, Singh had planned to run a full marathon after this one but was sidelined due to a knee problem. He plans to run again in 2014. The problem hasn’t stopped Singh from contributing to the cause. Earlier this year, he convinced his employers at the PCFC to donate 1% of their revenue for February 2013 to support this effort and raise money for the American Liver Foundation. 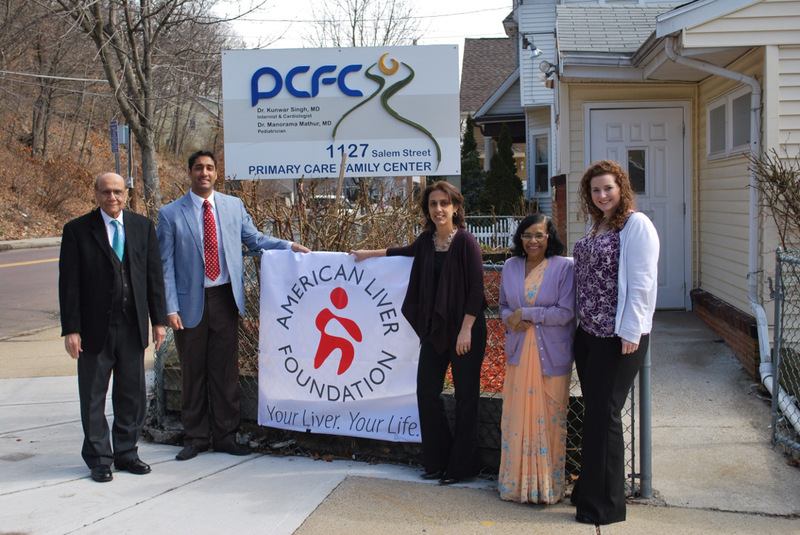 The PCFC, headed by Dr. Kunwar Singh and Dr. Manorama Mathur, has been in the Malden area for over 30 years. During that time it has been involved in several community service initiatives, including free health clinics, at which everything from flu shots to minor surgeries are provided to those in need. The donation amount was $1,000, each doctor contributing $500. “He set up for the practice to give 1% of their revenue and raise additional funds, that’s how he got so involved,” said Helen Garity, director of the New England Fundraising Division at the American Liver Foundation.